Okay I'm at a loss and my numerous searches haven't been very enlightening. 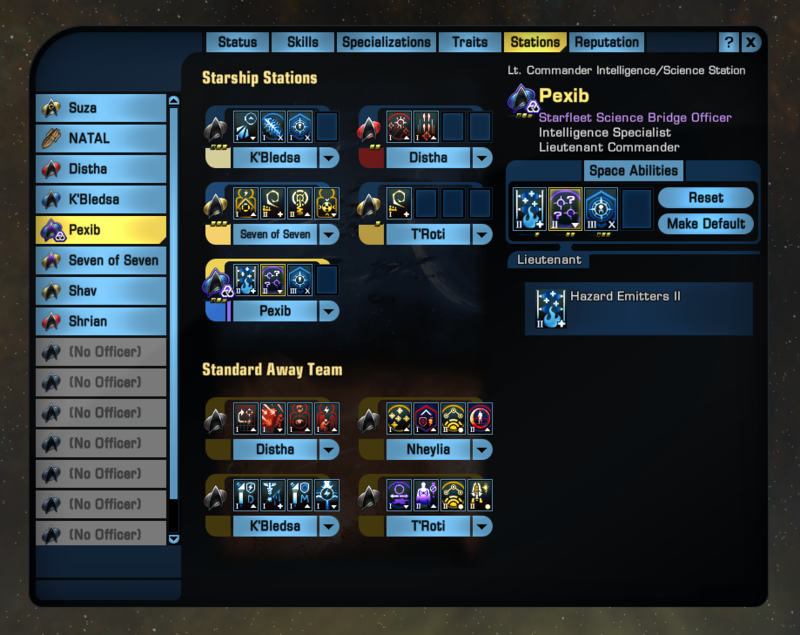 I've been away from STO for sometime, I jsut logged in and foundthat my bridge officers have lost all the skills I had them specivically trained in. Am I jsut screwed and have to start training my bridge officers all over again as a vice admiral? Grrr I can't even train them in the skills they had before.... where are all may darn shield stirpping abilities. Pretty much, depending on the skill they had. I know you're pretty livid atm, but trust me; having played with the new system for a few weeks now, it is so much better than before. Once a BOFF is trained in a skill, it's trained in that skill. No more fannying around retraining at ESD/Qo'nos when you switch ships. They revamped the boff system a few weeks ago. Its a minor adjustment to get used to but it offers a lot of benefits later on. I only had do reset my boff skills one time. I also found that the game memorized all original skills as well as all previous trained ones. Play a bit with the ui under stations display. Perhaps you have them still as well. If not look up boff trainer for manuals or exchange. All quiet cheap. Welcome to grind to get back what you once had. There are a ton of people who are up set that this has happened. 1. You can no longer trade bridge officers once they are commissioned to your crew. 2. Some bridge officers got a overhaul and lost skills this is BS but what can you do? 3. Now you must either craft training manuals or buy them off of the exchange to make your officer have those skills. ***NOTE*** one manual per officer so highly sought after skills are insanely expensive. I can see where the system is better but How the heck to I get the abilities I had before like charged particle burst and feed back pulse? If you select the boffs on the left, then click on skills tab at the top, you can select the default skill at each rank for that doff. This is also where you use training manuals you've bought/crafted to train boffs in new skills. 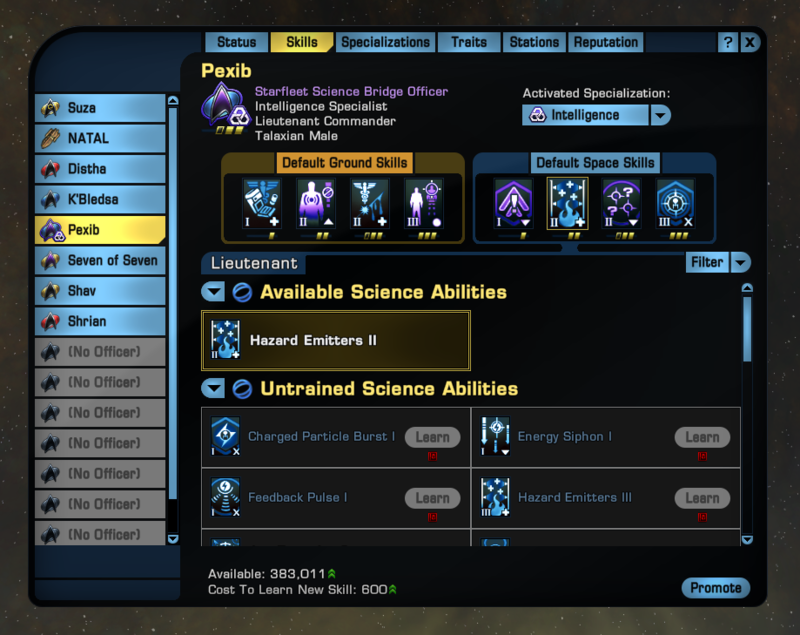 If you select your ship on the left, then stations tab top, you change the current skill to another one the boff is trained in by clicking a boffs skill and choosing a new one. TRIBBLE so much foractually playing for enjoyment I guess I now have to go learn the crafting system which I avoided before as it requires dilithium. Grinding the #1 reason I don't stick around more even though I am a lifer. You'll only really need to craft or buy 3 or 4 of the very rare boff skills tbh, in my experience and the most expensive I bought off the exchange was a GW3 for about 100k ec. The skill is still there. You haven't been untrained. You just had the "active" skill reset to default. This will happen a lot. The skills are currently kinda buggy. Go to the boff, click the skills tab, click the RANK of the skill, space or ground (ENS, LT, LtCDR or CMDR), and then scoll down to the available skills to choose the active one you want. Addendum to the above: If the boff is currently slotted on your ship, you need swap to an unused boff (or empty slot) and back again for the boff seat to update itself. I actually like this system and have enjoyed it since I came back. It's nice to just have a few BOFF's that I can train in everything and not 50 BOFFS with certain skills. Okay crisis averted they still have the skills. thank you all! Blah drip to ESD for now realon lol back ot the Delta quadrant for me. "The more they overthink the plumbing the easier it is to stop up the drain"
The new BOFF system has several advantages over the old, but it may have resulted in resetting the default skillso fyour bridge officers, and changing the skills may require unslotting them first. Assuming you did this all once. Under Stations, you can slot your bridge officers as you always could. but there are changes. You select the officer via the drop down below the station. If you click on the station itself, on the right hand side, you can see the current selection of skills. If you click on a skill, you will see below the skills that you could slot alternatively. You can do that pretty much any time you're not on red alert. This UI allows you to set the default loadout of a particular bridge officer. The default loadout is not automatically applied, it's only used if you slot a BO in a station, if he's already slotted, the original configuration remains. 2) If you have uncommissioned officer (I believe the screenshot doesn't show them, but the list is hidden away under the "Stations" tab behind a button), you can ask them to make a training manual fo ryou. The BOFF is then dismissed. If the BOFF is bound to you, so will the training manual, otherwise, it can be traded. 3) You can get them via the exchange from other players. Once you have a manual, you can pick a BOFF, pick the right slot, and then press "Learn". The BOFF knows the skill henceforth forever and can't forget it. You don't need to raise the rank in the skill anymore, that is simply gone (skills behave as maxed out in the old system). Each skill you train will raise the cost f training a new one, but I think the cost is never that excessive that it's a problem. The end result will be that you have more flexibilty than with the old system, whie needing fewer BOFFs.